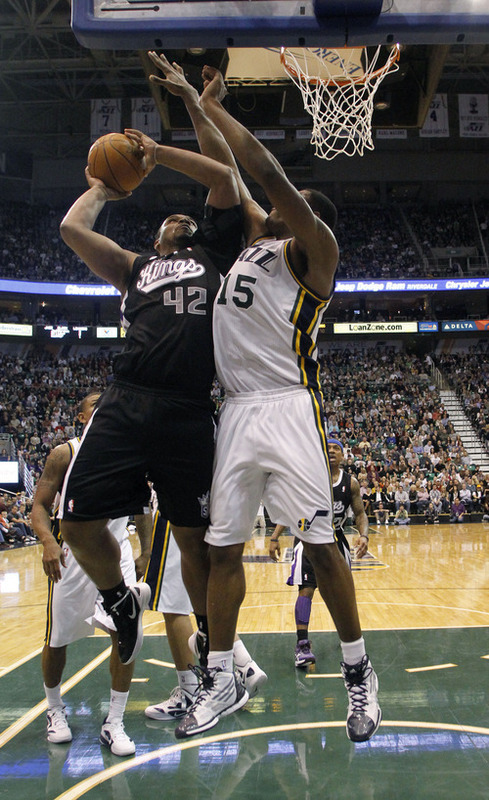 Jazz are among NBA's best at rejecting shots despite lack of big-name blockers. The Jazz's undersized big-men duo of Al Jefferson and Paul Millsap still patrol the paint. There's no DeAndre Jordan, JaVale McGee or Serge Ibaka lurking in the lane to suddenly leap through the air and annihilate a potential basket. And some of Utah's key shot blockers rely on nothing more than natural-born instinct and God-given hops to protect the rim, acknowledging they simply see and react rather than plot and destroy. But what the high-flying Jazz lack in big-name swatting expertise, they make up for with strength in numbers. Entering Tuesday, the Jazz ranked third out of 30 NBA teams in average blocks (6.5), better than defensively renowned squads such as Chicago, Boston and the Los Angeles Lakers. Jefferson tops Utah with 1.69 per game. But while Big Al was 12th overall in swats, the only other Utah players in the top 50 were second-year forward Derrick Favors (33rd at 1.06) and Millsap (tied for 49th at 0.84). Four other Jazz athletes average at least 0.5 blocks, though, with everyone from 6-foot-11 rookie center Enes Kanter to 6-foot-1 veteran point guard Earl Watson leaving a mark. The multi-hand attack supports statements by Utah's players and coaches that it's the team's renewed defensive focus and all-in approach making the shot-blocking difference this season, not a dramatic improvement by individual players. Jefferson's and Millsap's numbers are actually slightly down compared with last season. But as a whole, the Jazz's imposing front line and a deeper, more athletic roster are putting Utah in a much better position to protect the rim. "Personnel affects it more," Jazz coach Tyrone Corbin said. "We have young guys who are in position to get some more blocks. Derrick and Enes are bigger and a little bit more athletic." He added: "It's more of an emphasis on where we're going to bring guys to  standing between your man and the basket and playing your man first. It's more on the guys to take pride in themselves and not let their man score." Sixteen-year veteran center Marcus Camby said pride is at the core of all true NBA shot-blockers. The Portland big man who recorded four blocks Monday in a 93-89 road loss to Utah has led the league in average blocks four times, and his 2.5 career average is tops among active players. Camby relies on two factors to shoot down shot attempts. No. 1: timing. Long arms and leaping legs are one thing. But the ability to jump skyward and perfectly synch up with a just-released ball is essential, especially in a league in which pump fakes and hesitation moves are the norm. No. 2: video. By dissecting an opposing player's tendencies before tipoff, Camby enters contests primed to flick his wrist and swat away. "I just try to put myself in a position to not only just block the shot but also to alter shots," he said. "Sometimes altering a shot is just as good to blocking a shot. … I think I'm a pretty good weak-side shot-blocker. The guys don't really see me coming. When these guards come into the lane, they're worried about scoring. I'm just trying to see where their release point is going to be at and just jump up and block it." Jefferson has never been an elite defender and often struggled last season to guard the paint. But after spending the NBA lockout fine-tuning his body at a high-performance training facility in Santa Barbara, Calif., he's faster and more limber, and his lateral movement has noticeably improved. Jefferson knows he's not Dwight Howard, and he doesn't have the natural leaping ability of the 20-year-old Favors. But Big Al's always had good timing  he recorded 26 blocks in a single high school game. Eight years into his professional career, he's playing the best defense of his life. He's been the primary push that's placed Utah near the top of the swat chart, and he's linking arms with Millsap, Favors and Kanter to form a four-man version of legendary Jazz shot-blocker Mark Eaton. "These young guys keeping me young, man. … I've got to live up to that," Jefferson said. "Because if you don't [play hard] in practice, they're going to block every shot you throw up." About the Clippers • Los Angeles has won four of five, including victories over Memphis, Denver and Oklahoma City. … The Clippers rank fifth out of 30 teams in average scoring (98.6) and seventh in assists (21.8). … Forward Blake Griffin leads L.A. in points (21.1) and rebounds (11.1).